A natural hillside bordered with sugar cane and filled with colorful indigenous flora provides the backdrop to your stay at Sugar Ridge. Breathtaking views of palm fringed beaches and the turquoise Caribbean Sea, catch the neighbouring islands of Nevis, St. Kitts and Redonda. The hotel shuttle will take you to one of the many nearby secluded beaches. Browse through the selection of shops in the Sugar Ridge 'Village'. Alternatively you can visit Jolly Harbour Marina just two minutes away, which is a hive of activity throughout the day for boating enthusiasts. Numerous boating excursions, deep sea scuba diving and deep sea sport fishing trips depart from the Marina. The Jolly Harbour complex also has its own 18 hole golf course and all weather tennis and squash courts. The hotel has 60 deluxe bedrooms, each with their own entrance, all wrapped around the hill. Each room offers an ambience of quiet seclusion whilst natural landscaping provides privacy, and all enjoy spectacular views. The spacious verandas encourages laziness in abundance, whether you are reading a book on the daybed of an upper floor room, or relaxing in the private plunge pool of a ground floor room. The professional interior design creates a cooling environment in a modern contemporary style. State of the art amenities and technology at your finger tips include radio frequency activated door lock, iPod dock, electronic safe, LCD flat screen TV and complimentary Wi-Fi Internet access. Carmichael's elevated location ensures panoramic views with sensational sunsets. 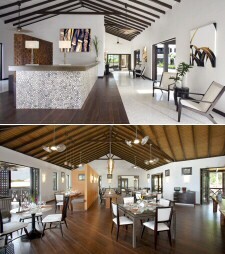 Sugar Club is located in the heart of the resort. It has a 'buzzy' feel, great for people watching, overlooking the two main swimming pools and sunbathing decks. Sugar Ridge will provide the most fabulous venue for your wedding, with stunning views as a montage for those special photographs. Our dedicated wedding advisor will be on hand to coordinate all the arrangements for your big day. If you are looking for an active holiday and plan to make the most of your stay on our beautiful island or just chill out at the hotel then look no further than Sugar Ridge! Located on the upper level with panoramic views having a large veranda with sofa bed and dining area. The bedroom with king size bed is air-conditioned and also has ceiling fan. The bathroom has a single basin and glass walled walk in shower. The bedroom and veranda measure approximately 550 sq. ft. or 51 sq m.
Pax From To Double Occ. Single Occ. Offering the best of both other room categories Premium Suites are located on the highest part of Sugar Ridge, are very private with breathtaking views. With rafted ceilings, king size bed, air conditioning and ceiling fans. 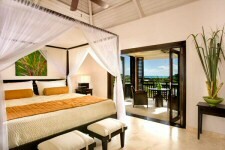 The large veranda and plunge pool complete this exclusive setting. Offering the best of both other room categories. Premium Suites are located on the highest part of Sugar Ridge, are very private with breathtaking views. One Child in Connecting room with two Adults in adjacent room $75.00 off Single Adult Room & Breakfast Rate. Two Children in Connecting room with two Adults in adjacent room $100.00 off Double Adult Room & Breakfast Rate. Inclusive Pan includes drinks until 5.00pm & lunch at nominated beach restaurants. Some restrictions apply. A deposit of 3 nights to a secure a reservation. Non arrival or cancelled within 24 hours of arrival full cost of booking will be charged. Stays of 3 nights or less must be pre-paid, Between 1 and 6 days 50% of booking will be charged.